1) I’ve become friendly with Padres closer Heath Bell. 2) Heath knows about my baseball collection and seems to enjoy adding to it. 3) When I saw Heath on 4/15/09 at Citi Field, he told me he had saved a ball for me from the World Baseball Classic–but he didn’t have it with him. The ball was in San Diego. Ever since that game, Heath and I have been texting back and forth, trying to figure out when and where we could meet. Obviously, since the Padres’ travel schedule was set, it was up to me to make the effort. The week before the All-Star Game, Heath left me a voice-mail in which he asked if I was going to be there. “Unfortunately I don’t have a ticket for ya,” he said, “just ’cause I got a bunch of people coming, but hey, if you are, hit me up.” I called him back, got his voice-mail, and told him that I was not going to be attending the All-Star Game. Then I reminded him that I’d be in Philadelphia on July 23rd and said that if he happened to see an extra All-Star Game ball lying around, it’d be cool if he could grab it for me, but if not, no worries. On July 21st (the day before the Padres were going to be leaving on an eight-game road trip), I texted Heath with a “friendly reminder” to bring the ball from the World Baseball Classic. Yesterday was THE day: July 23rd at Citizens Bank Park. Was Heath really going to bring the ball? I wasn’t sure…and it ended up raining like hell during the drive down to Philly (see the photo on the right)…but I had to keep going. I had to be there. To hell with batting practice. There was no other way I’d ever get to count a ball from the World Baseball Classic in my collection. As I’ve mentioned many times before, I don’t count Spring Training balls, and the only minor league balls I’ve counted were used by major league players at major league stadiums at actual major league games. (For the last few years, the uber-cheap Tigers have been using balls like this and this during BP.) Along these lines, I decided back in 2006 not to count balls from the Classic–it’s an exhibition that isn’t exclusively played by major leaguers–but if I somehow were to snag a Classic ball at a regular season game, that would be the one exception. There was no sign of life either, and for a while I didn’t know what to think. Would there possibly be batting practice? Would there even be a game? During that first hour, I managed to snag three balls. The first was thrown by Joe Blanton at the furthest edge of the seats in left-center field. The second came via the glove trick near the foul pole, and the third was a home run that I caught on the fly. I don’t know who hit it. There’s a slim chance that it was Jayson Werth, but whatever. Doesn’t matter. I could tell that there was a ball inside…no wait…there were TWO balls inside. It was some sort of tube sock…dark green fabric…with knots tied around each ball to keep them separate. My mind couldn’t process it, but I snapped back to reality just in time to yell “Thank you! !” as Heath jogged off toward right-center. Two balls?! Seriously? Had he given me two balls from the World Baseball Classic? Or was one of them from the All-Star Game? Or maybe from some other All Star event? Since I now number my baseballs, how would I know which one I’d snagged first? I got them both at the same time. But why even number them if they were each one-of-a-kind? …but just as I was about to start untying the knots, several righties starting taking their cuts, so I threw the sock back in my bag. AAHH!! It was killing me to keep waiting, but it would’ve killed me to miss any opportunities. My decision paid off. Someone on the Padres hit a home run that landed near me in a small cluster of fans. The ball got bobbled (not by me) and landed briefly on the top edge of the back of the seat right in front of me, at which point I snatched it. Nice! That was my seventh ball of the day, including the two that Heath had given me. Anyway, a bunch of lefties started hitting so I ran over to right field and ended up catching a home run on the fly. See the guy below in the “HAMELS 35” jersey? After I caught the ball by reaching in front of him, he threatened to throw me over the wall. If I’m remembering correctly, his name is Morgan. I asked him if he has ever tried to catch baseballs at games, and luckily for the rest of humanity, his answer was no. Can you imagine how much he would dominate? Who would ever stand next to him? He’d have a whole section to himself wherever he went. Is there anyone reading this who’s freakishly (and I mean that in a good way) tall? If so, I want to hear about your snagging experience. I wonder if there’s ever been a seven-footer who was serious about ballhawking. Yikes. After the national anthem, Heath and I caught a glimpse of each other near the dugout. I mouthed the words “thank you” and put my palms together and make a little bowing gesture. 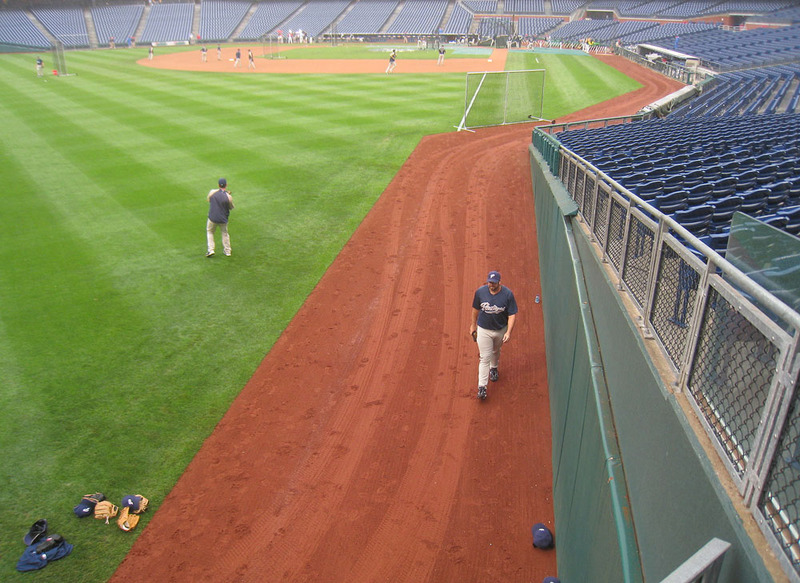 He gave me a nod as he began walking across the field toward the bullpen, and that was the last I saw of him. The only problem was that there weren’t any foul balls to be caught. That area seems like it would be awesome, but it’s so close to home plate and so close to field level that most foul balls fly way overhead. Still, the ball was clearly game-used, so that was cool. As soon as I snagged it, I gave one of my BP balls to a little kid. It just so happened that an on-field security guard (who recognizes me, it should be noted, and is exceptionally rude) saw me hand it over. What was his response? Instead of a) praising my generosity or b) simply keeping his mouth shut, he c) started scolding the ballboy for giving a ball to me (“What’s the matter with you? !”) and demanding that I give away balls to all the other kids in the section. Citizens Bank Park has officially become Yankee Stadium. • 320 balls in 37 games this season = 8.6 balls per game. What a great day you carved out for yourself. And what a terrific Zackfan Heath Bell is. It’s amazing how you two have hooked up – fan and player. Ya know how you placed The Hample curse on Chacin because he snatched a ball away from you during an attempted glove trick? And your curse wrecked his career? Why not do the opposite for Bell? Place the Hample Blessing on him, so he’ll become the best closer since Mo. Keep up the good snagging – and the fine writing. Good job on the 10 balls, Zack. I’m having terrible luck this summer with snagging. I didn’t bother versus the Yankees and Red Sox in June thanks to the the transplant fans’ invasion. Then, work prevented me from getting to the Ted early on this last homestand. I had finally planned to snag against San Francisco, but a bad cold kept me at home. My bit of good luck came on Sunday Night Baseball when David Wright fouled one off to my great spot behind the Braves dugout in the cross aisle. A fan had it lined up, but failed to catch it and it rolled down some steps right to me. No competition since everyone was focused on the guy trying to make the barehanded catch. I can’t wait for school to start so I can have BP back to myself lol. Hey Zack, nice game. Heath Bell sounds like THE man. I’m glad he’s having a stellar year. I’m heading off the a Northwest Arkansas Naturals’ game soon. (AA affiliate of the Royals BTW) Once again congrats, and due to your great tips, I know I’ll return with a boadload of balls. Wow, Zack! Great entry and I’m glad Heath hooked you up. I’d been waiting to read this since TC mentioned to me at Angel Stadium BP that you were in Philly. Thanks again for inspiring so many people (like me) to take up similar collections–I’ve got 12 this week! But no commemorative Metrodome balls from the Twins even though seven of the balls I snagged were from when they’ve been in town. its funny that they make everyone huddle in LF during BP since during the game they guard LF like its Fort Knox. what’s the story with the green sock? maybe its heath’s game used sock from one of the Padres camo-uniform days? Man, Heath Bell is a cool guy. It’s nice to see players make a connection with fans over their shared love of the game. That WBC ball is a very unique specimen; I’ve never seen gold used on commemorative balls before. Keep up the good work, ZH! i hope the all star balls r used during bp. heath bell is awesome. got his auto at the last second at the nats game last night. i tried to tell him tht i knew u, but he went off too fast. got 6 in my first game of my mini trip. nats game tonight. camden on monday, see u there? Sweet, I am glad I got to meet Heath when he was playing vs the Rangers this year. Only one day before you mentioned in the blog that you would be going to this game. Next time you are in Texas we can get the good food at the ball park. Not only the cheap food. Hopefully I can get some balls later this year. Nice entry. Glad to see Heath kept his word in brining you the WBC ball. About the height thing i geuss you can say im pretty tall if you remember how tall i was at the disney series last year. Im 16 and about 6’3- 6’3 1/2 now, and the height for me doesnt help to much in regular seats unless a ball is tossed up by a player, but i have a HUGE advantage when it comes to bp on the berm at disney for spring training or the past 2 disney series that were played down at disney. When the ball is coming over and its the mob of fans trying to catch it ( as you may remember when you were down last year ) Im able to jump and out reach everyone including many muscular adults. Did you see that you were mentioned in an article on Canada.com today? Check it out! It is a decent article! also how are you doing in the Beat the streak thing on mlb.com? That is awesome. I am jealous. Juan Nieves and Mark Salas of the Chi White Sox bullpen keep their pre-game warmup balls (balls rubbed up with Lena Blackburn mud) for their starting pitching staff in a sock similar to the one Heath gave you. I have a Watch With Zack game tomorrow afternoon at Yankee Stadium. Looks like the weather is gonna be good, but who knows if there’ll be batting practice? Sounds like a rough stretch for you, but congrats on that foul ball. The cheerleaders aren’t normally there. They were just there that night for some random reason. Thanks and good luck in Double-A. Sorry you didn’t get a Twins ball. Any other chances this year? Maybe there’ll be some of those balls floating around next season. If you look at all my commemorative balls, you’ll see a few others with gold stamping…but it’s rare. That’s cool that you got Heath to sign, and nice job with the six balls. Camden Yards on Monday is looking good! C’mon now, that’s not THAT tall. Still cool. But not the kind of height where you can dominate without even jumping. I’ve been struggling with Beat The Streak, but I currently have an 8-game streak, so that’s nice. Sure, if you really want it. I thought you knew when you gave it to me that I’d be getting one from Heath. I talked all about it on my blog in April and then I saw you in May. I was wondering why you gave it to me (beyond the fact that you’re a very generous individual). I had no idea about the Canada article. I was interviewed for that a few weeks ago and then forgot all about it. Thanks for letting me know. You’ve seen my blog entries about L.A. and Anaheim, right? Check my archives from August 2008…end of the month. Cool. I’ve seen those ball socks before. I don’t really get it. for a 16 year old i geuss its kinda tall but not that tall. maby in the future ill be one of those freakishly tall guys like 6’11 who knows. And thats not to bad with the beat the streak thing it took me like 10 trys to get to 8 but now i have a current streak of 21 so hopefully i can continue picking well. zack, you going to be at citi field on monday? anyway, last night they were advertising an obnoxious amount for people to come sunday. i asked around, turns out eric gagne is starting for quebec today. in independent ball. i saw him warming up last night, which was weird because i talked to one of the coaches and gagne only usually comes when hes pitching. when the game got rained out, gagne sent a batboy to the concession stand for a six pack for himself. it was rather funny. well hes pitching today, im pretty interested in how hes gonna throw. Hey you are gonna pass Pete Rose soon. I would just like to formally announce myself as a ZackFan. I love reading this blog even though I’m not really a ballhawk myself. It did inspire me to create a blog about my own collection. Zack, maybe I’ll see you in Boston sometime! Did anyone see the front page on MSN.com?? One of the slides on the featured stories has a photo of Zack and links to the Wall Street Journal article from a few weeks back claiming we’re all money-hungry. if i ever get a ball with any value from anyone i want a donation to a charity of my choice and a authentic jersey. Wow that’s a pretty good hook-up. Sorry for not commenting these past couple weeks, but I have been reading almost every post. The most interesting would have to be the Newark Bears game. That sounds awesome to hang out with those players/coaches at the stadium. I just went to the Giants/Rockies game on Saturday night, but there was no BP because of fan photo day (WTF?!) but I ended up with Barry Zito’s autograph and a ball from Nate Schierholtz. I am going to follow the Giants this weekend for their games against the Phillies, I will see if I can get a ball at my first MLB stadium besides Coors Field. Hey Zack – I’ve been following along for almost a year now, first time commenting. Heath Bell is really a class act. The fact that he protected them in that sock and even tied a knot in between them to prevent them from scuffing each other shows that he knows they mean a lot to you. MLB could use more like him (players and stadium staff). Are you planning to come down to Baltimore again soon? I’ll be there 8/14 vs. the Angels and 9/5 vs. the Rangers. I know this is an older entry and shame on me for not getting to it sooner. NICE PLAYER WIN. I really could have used your Heath Bell stories in my most recent entry. I wish I’d thought of that. Congratulations on the commemorative balls! I can’t remember if I told you this or not, but I had to summon the knowledge I gained from your blog to acquire two balls from my beloved Rockies. One was from a bullpen member (whose face or number I could not see) and it was RUBBED UP and had GRASS on it. I was psyched. The other was tossed to me by Ian Stewart… but I missed it. Embarrassing. But the nice guys behind me gave it to me. Well yeah, that’s true, you’re probably gonna grow at least a few more inches. VERY impressive streak. Let me know how that goes. Thanks for letting me know. I took a screen shot (thanks to you) which I might share in a couple days when things calm down a bit. Whoops…delayed reply, but no, I wasn’t there. I was at Camden yesterday. I’m pretty much trying to avoid Citi Field as much as possible. I do NOT like that place at all. I don’t like how it was designed, and I don’t like how it’s run, but I’ll continue to make occasional appearances here and there. A six pack of beer?! Or soda? You are too kind. Not sure if I’ll make it up to Boston this season, but I’ll be back soon-ish, for sure. That’s a good line. I should use it. No worries about not commenting. I barely have time to read any other blogs, let alone comment on them. Thanks for reading and commenting. I was just in Baltimore last night, and I’ll be back there on August 10-11.